When we think of bees, honey and pollen are foremost in our thoughts. Yet another important substance, propolis, is a sticky resin secreted by trees. Honeybees collect and metabolize the propolis, then line their hives with it to protect the hive. It’s so effective, the interior of the bee hive is safer than most operating rooms. The name Propolis is derived from the Greek meaning “before the city,” signifying that propolis defended the entire community from external threat. Propolis has a 5000-year history. The Assyrians and the Greeks used propolis to help maintain good health. Fortified with Royal Jelly, Forever Bee Propolis™ is an excellent way to help support the body's natural defenses. Forever Bee Propolis™ is gathered from pollution-free regions. To further assure purity, specially designed bee propolis collectors are used. 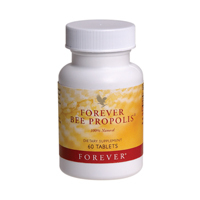 Forever Bee Propolis is 100% natural with no added preservatives or artificial colours. It is also an excellent natural food form, providing a wide array of useful trace elements. One tablet, twice a day, preferably before meals. Consult your physician before taking this or any other dietary supplement.